By now, just about everyone knows that an inverted yield curve is a sign of an impending recession. An inverted yield curve is the bond market's way of saying that the Fed is expected to cut rates in the future, usually because the economy is fragile and weakening on the margin. High real interest rates are symptomatic of a strong economy, but also of a shortage of liquidity. Swap spreads in the US have been low for the past several years, and they are especially low today. 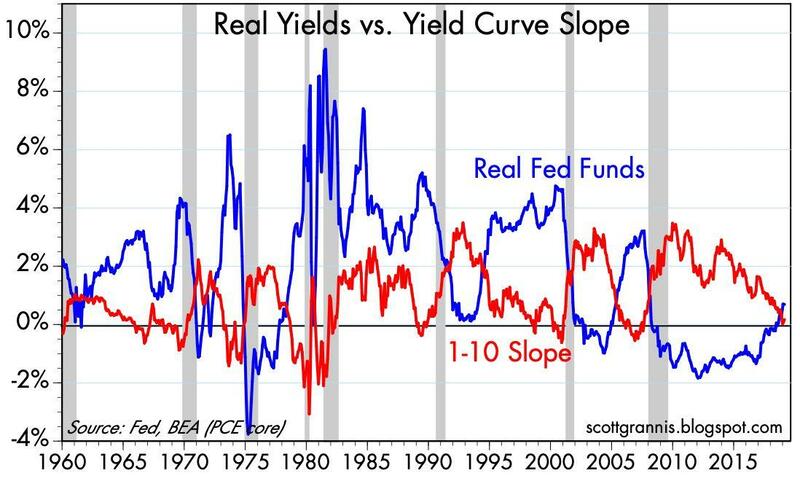 We see a modest inversion of the front end of the real yield curve (because 5-yr real yields are less than overnight real yields), which further suggests that the market believes the Fed will lower its funds rate target once or twice in the foreseeable future. 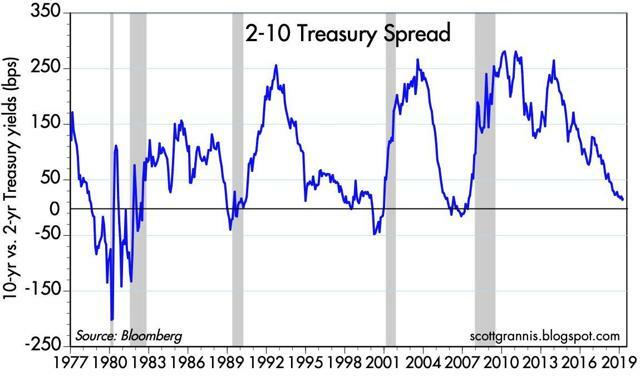 By now, just about everyone knows that an inverted yield curve is a sign of an impending recession. It may be a necessary sign, but it is not sufficient. It takes more than an inverted yield curve; it also takes very high real interest rates, which are the Fed's most powerful tool, to trigger a recession. 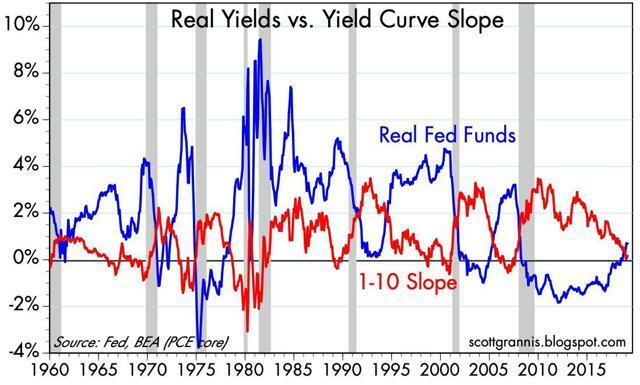 Today the yield curve is only slightly and partially inverted, while real yields are still relatively low. An inverted yield curve is the bond market's way of saying that the Fed is expected to cut rates in the future, usually because the economy is fragile and weakening on the margin. While today there are some signs that the economy may be weakening, there are still numerous signs that the financial and economic fundamentals of the US economy are healthy, and thus the outlook for the future is still positive. In short, the raw material for an impending recession is still lacking. We'd need to see the Fed get a lot tighter before starting to worry. Chart #1 shows how every recession was preceded by an inverted curve (red line) and high real short-term interest rates (blue line). High real interest rates are symptomatic of a strong economy, but also of a shortage of liquidity. Before 2008, the Fed tightened monetary policy by restricting the supply of bank reserves. This caused the price of reserves to rise as banks competed for the reserves they needed to expand their lending activity. A scarcity of bank reserves caused liquidity conditions to deteriorate, while expensive (to borrow) money weighed heavily on weaker borrowers. Today, it bears repeating that the Fed no longer drains reserves in order to tighten: it simply raises the rate it is willing to pay on bank reserves. Bank reserves remain abundant, with excess reserves totaling about $1.5 trillion. If the economy falls into a recession, it won't be the Fed's fault. Chart #2 shows the all-important spread on 2-yr interest rate swaps. Swap spreads in the US have been low for the past several years, and they are especially low today. Swaps spreads in the Eurozone are still a bit above what one would consider "normal" (10-25 bps), but they are declining on the margin. 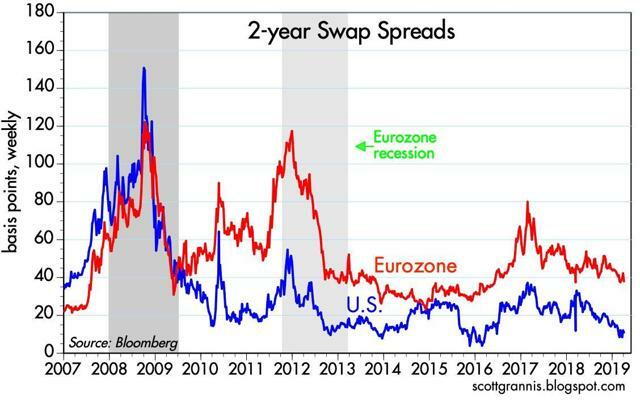 As I mentioned in my last post, declining swap spreads and rising equity prices in Europe suggest that the Eurozone economy may be pulling out of its long slump. That would obviously be very good news for everyone. Chart #3 shows spreads for 5-yr generic Credit Default Swaps. This is a timely and liquid indicator of the market's outlook for corporate profits - with lower spreads reflecting increasing confidence. 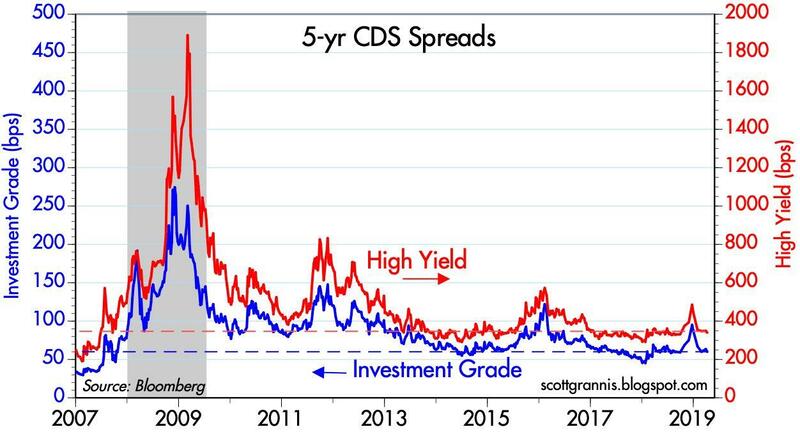 Credit spreads today are quite low. The market may profess to be worried about a weaker economy, but the appetite for credit risk remains strong. 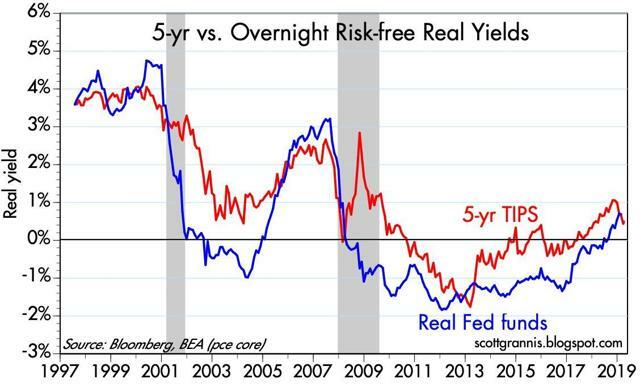 Moving on to the yield curve, Chart #4 shows overnight real yields (blue line) and the market's expectation for what overnight real yields will average over the next 5 years (red line). Here we see a modest inversion of the front end of the real yield curve (because 5-yr real yields are less than overnight real yields), which further suggests that the market believes the Fed will lower its funds rate target once or twice in the foreseeable future. This is arguably evidence that the market thinks the Fed is "too tight" and will be forced (or coerced?) into cutting rates at some point. But it is not a prediction that the economy is going to suffocate for want of liquidity and high borrowing costs. Chart #5 is the most popular measure of the shape of the yield curve: the difference between 2- and 10-yr Treasury yields. Here we see the curve has had a mildly positive slope for the past several months. But it is not flat or inverted. 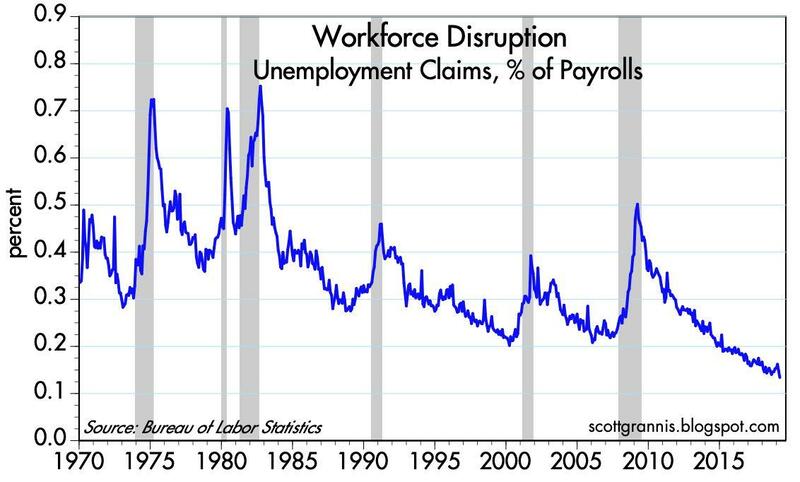 We've seen periods like this in the past that were not followed by an imminent recession. Chart #6 looks at the slope of the long end of the Treasury curve (over which the Fed has very little control or influence). Here we see that the curve is definitely upward-sloping. It was like this for several years in the mid-1990s, when the economy was booming. 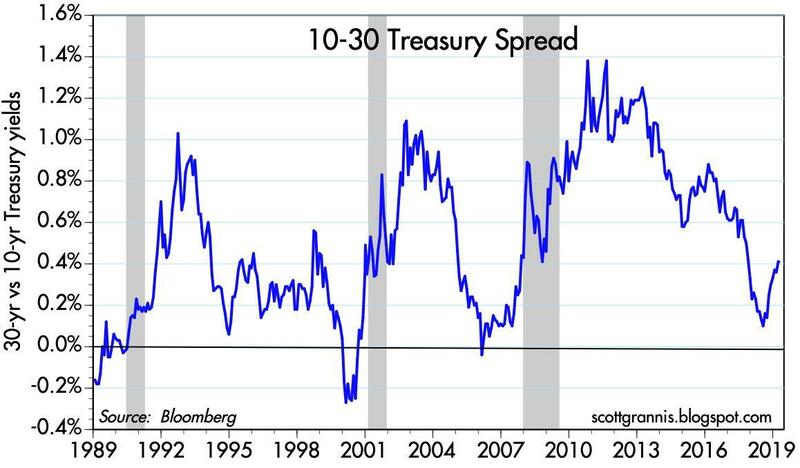 So: yes, parts of the yield curve are flat or inverted, but it's not necessarily because the market expects or senses that a recession is looming. Meanwhile, real yields are still relatively low and liquidity conditions could hardly be better. This is not the stuff of an impending recession. 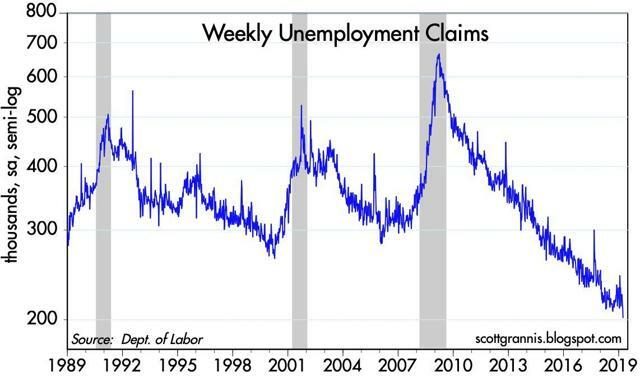 Moving on to the labor market, Chart #7 shows that first-time claims for unemployment are at record lows. Relative to the size of the labor market, claims are an order of magnitude lower than they have ever been before. This is nirvana for the average worker since it means the likelihood of losing one's job today is as low as it has ever been (see Chart #8). No wonder consumer confidence remains high. 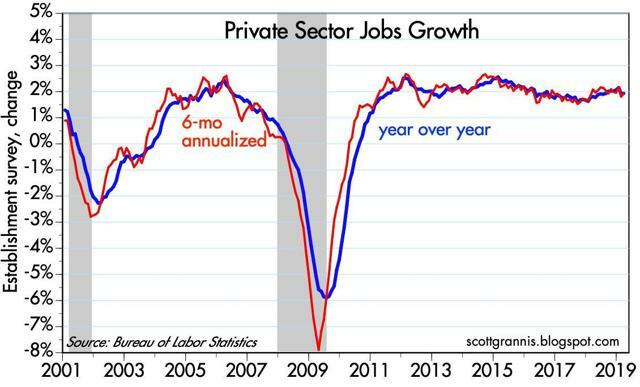 Chart #9 shows the growth rate of private sector jobs (the ones that really count) over rolling 6- and 12-month periods. 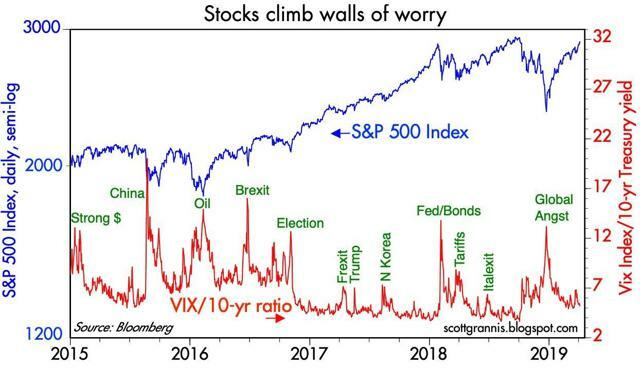 (It's foolish to look just at monthly numbers, since they are notoriously volatile). 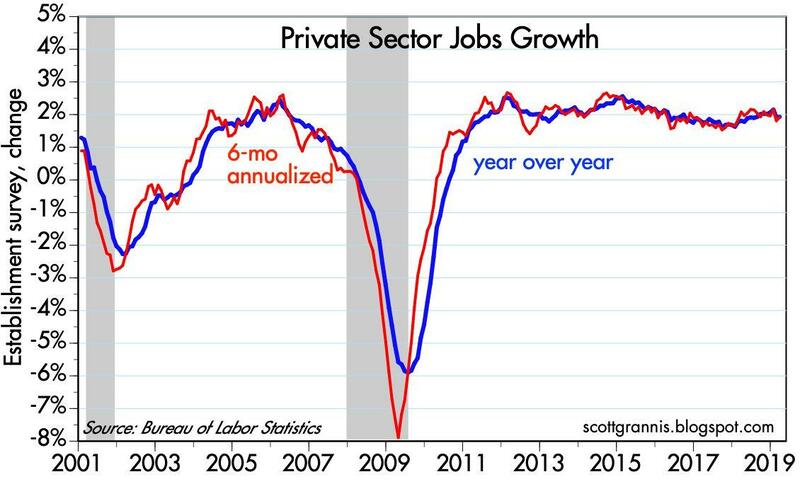 Here we see a modest weakening in growth of late, but nothing serious. Finally, Chart #10 shows that the market's general level of concern/anxiety (as measured by the ratio of the Vix index to 10-yr Treasury yields) has been declining as equity prices have almost completely retraced their 2018 year-end selloff. I can't say the economy is booming, but I do think the economy's fundamentals remain healthy. The Fed is not making any obvious mistakes, the dollar is reasonably strong and relatively stable, overseas equity markets are rallying along with ours, regulatory burdens are declining, consumer confidence is high, tax burdens have been cut, especially for businesses (the ones who are the job creators and the drivers of rising prosperity), gold prices are relatively flat and trendless, industrial commodity prices are rising, and it appears that we are gradually coming to an agreement with China on trade and intellectual property rights (i.e., the risk of a trade war is definitely declining). Thus, it pays to remain optimistic. P.S. Sorry it's been so long since my last post. We've had a rather busy travel schedule (Chile, Argentina, and Italy) which will be winding down over the next few days.